I’m always frustrated at this time of year because there are so many events of interest to me in Pittsburgh that seem to happen on the first weekend of October. Since I cannot attend all of them, I figured I might as well attempt a public service and mention some of them so that if you are in the Pittsburgh area, maybe you can go and enjoy what I can’t attend. So here are 9 of the probably dozens of cool things you could be doing tomorrow, Saturday, October 5, 2013. If you’re interested in ragtime or Latin music, check out this concert by the Allegheny City Ragtime Orchestra. Abby and I wanted to go, but finally decided that we have too many other activities earlier in the day and need to just stay home and unwind in the evening. The 8th annual PodCamp Pittsburgh should be good. If you have any interest in using social media for personal or professional purposes, you should check it out. Interesting talks, opportunities to just socialized and learn new things. I attended in 2010, 2011, 2012, and will attend again for the fourth year. Unfortunately, I will only be able to attend the afternoon sessions. But I didn’t want to completely miss it. The annual Pittsburgh South Side Slopes Step Trek is another event you can attend tomorrow. Check out my blog coverage two years ago as well as my recent update. Unfortunately, Abby and I will be missing it this year. If you like to run in races, a fine race is the Run Shadyside 5K. Fast and flat, with a pancake breakfast and festivities afterwards. I’m not running in it this year, just because I have too many other things to do already for the rest of the day, but here’s my report from two years ago. Interested in green living? 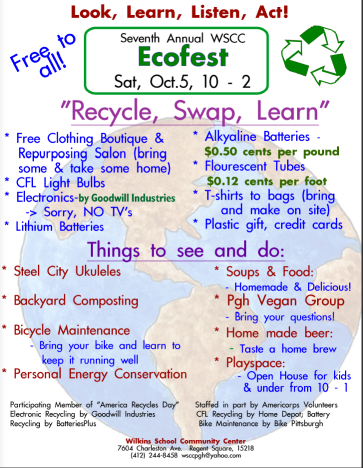 Check out the 5th annual Wilkins School Community Center Ecofest in Regent Square. Abby has regularly attended for the clothing swap. There will also be food, information, and entertainment. It turns out that this year, I will also be attending, to perform as a new member of the Steel City Ukuleles. I just started playing the ukulele a bit over two months ago, and have been working hard to help put on an entertaining show! We’ll be performing around 11:30 AM to 12:30 PM. If you come, say hello! Or, if you are into weird running events, there is the Carnegie Mellon University Donut Dash, a 2 mile event serving as a fundraiser for the Children’s Hospital of Pittsburgh of UPMC. This is not an event I have ever done, and not one I intend to do, but what the heck, some of you might love this sort of thing! Did you know that it’s time for National Chess Day? There will be a tournament at the Pittsburgh Chess Club, the 56th annual Gateway Open. Yes, chess in Pittsburgh has a long and illustrious history. If you are a Perl programmer, the Pittsburgh Perl Workshop is back this year. Registration is already closed, so it’s not so helpful right now for me to mention it, but in case you didn’t know it existed, watch for it next year. Actually, I guess I miscounted. But there are a whole lot more than nine things to do in Pittsburgh tomorrow. For example, if you are interested in some free stuff to do, there’s RADical Days listing a whole bunch of stuff. There’s no shortage of stuff to do in this great city of Pittsburgh at any time or day of year. I think it’s unfortunate that many things I like to do happen to repeatedly fall on the first Saturday of the year, but I’m not complaining about an embarrassment of riches. Go out and take advantage of what I can’t.